The University of California released last year’s payroll data Wednesday, illuminating both salary increases and a continued earning gap between male and female faculty salaries. The annual payroll data depict a 3 percent salary increase for nonunion employees for the second time in six years, as well as a continued tradition of athletic directors and health sciences faculty representing the highest-paid positions at the university. In addition, the university falls in line with the national gender gap trend, as significantly fewer women work in the highest-paying positions than men. A report released by the university used this data to highlight the declining percentage of state and student educational fees used to fund payroll, as well as the effect of declining state support, which has pushed university employee compensation below market. The annual presentation of payroll data — displayed in the form of a searchable database — is part of the university’s effort to provide transparency and public accountability through the names, titles, locations and pay for university faculty and staff, which includes student employees and part-time and temporary workers. As of October, the university had approximately 101,000 full-time employees, which is about half of the total number that includes student and part-time employees. According to the university report, payroll made up about half of the university’s $23.9 billion annual operating budget. The total payroll grew from $11.2 billion to $11.7 billion from 2012 to 2013, due in part to market pressures to establish more competitive faculty salaries. According to the payroll data, 19 professors across the 10 UC campuses made more than $1 million in 2013, all of whom are connected to their campus’s medical school or medical centers. None of the professors are from UC Berkeley, while 10 are from UCLA. 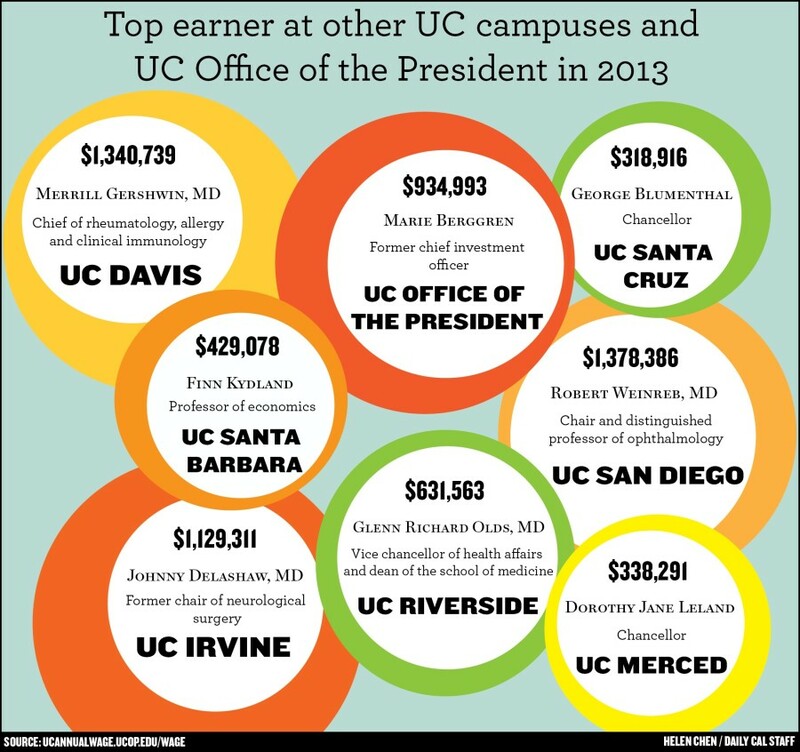 In 2012, 20 employees from the UC system made more than $1 million; in 2013, that number expanded to 29. In 2013, the number of UC Berkeley employees making more than $500,000 increased from four to 11, compared to the previous year. Five of the 11 employees were athletic coaches. Chancellor Nicholas Dirks has a base pay of $486,800, according to campus spokesperson Dan Mogulof. Former chancellor Robert Birgeneau had a base pay of $436,800 for 2012 and 2013. Four women held positions in the 50 highest-paying jobs throughout all UC campuses and the UC Office of the President, while seven women were among the 50 highest-paid employees at UC Berkeley, down from 10 in 2012. Mark Yudof, the former president of the university, had a base pay of $591,084 in 2012, while current president Janet Napolitano had an established base pay of $570,000 when she took office last year. According to the 2013-14 American Association of University Professors faculty salary survey, which reviewed 1,156 institutions, UC Berkeley falls into the 89th percentile among doctoral institutions in terms of full professor salaries. 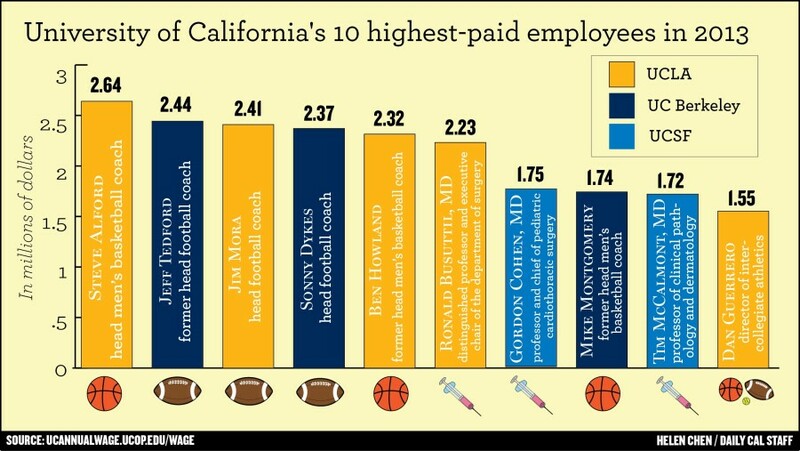 The survey found that UCLA’s faculty salary average of $173,900 was higher than that of UC Davis, at $136,700. UC Berkeley is in between with an average of $165,400. In addition, the salaries for female professors on campus average $155,000, thus 91.7 percent of their male counterparts, who make, on average, $169,000. At the associate and assistant professor level, this disparity increases to 88.3 percent and 88.7 percent, respectively. In comparison, female professors at Stanford University make 96.8 percent of male professors’ salaries and female associate and assistant professors make 89.3 percent and 95.4 percent of their male counterparts’ salaries, respectively. According to the survey, male faculty salaries at UC Berkeley have also increased at a faster rate in recent years when compared to female faculty salaries. Rothstein added that there are a number of complex factors to consider in terms of gender equity and pay. “I wouldn’t be surprised to hear that, once you did account for all of the different factors, that there’s still a gender gap,” Rothstein said.